Industry has discovered that many petroleum products or lubricants combined with lead or graphite will work up to a certain amount of pressure, but that when the operation requires extreme pressure, all ordinary lubricants break down and allow metal-to-metal contact with consequent scoring, frictional heat, work and cutting tool damage. 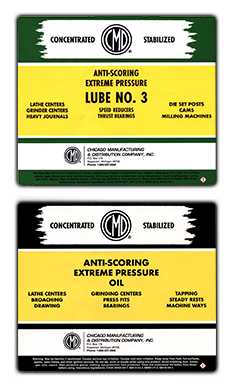 CMD anti-scoring lubricants are not ordinary lubricants. They are compounded of highly refined petroleum products containing no lead, graphite or minerals. They will not corrode the finest surfaces nor will they mulsify with cooling liquids. But these facts are not the most remarkable feature of CMD lubricants. The truly outstanding property of CMD is its ability to withstand extreme pressures! The thousands of firms who have used CMD have discovered that commonly used lubricants will provide a lubricating film at pressures of 500, 1000, 5000 and even 10,000 psi. By contrast, CMD EXTREME PRESSURE lubricants are regularly used from 40,000 to 50,000 psi. CMD Lubricants are prepared in two consistencies — Grease and Oil. The two consistencies work equally well – choose the one which best fits your application. For efficiency and convenience of application, CMD Lube #3 is available in 4 oz. tubes and 14 oz. cartridges. CMD Oil is available in 4oz. tubes. For best results store CMD at the temperature at which it will be used so that it can be used immediately. It can be stored for indefinite periods without danger of settling or bleeding. This is why many plants throughout industry specify CMD Anti-Scoring Extreme Pressure Lubricants for their really tough lubricating jobs.